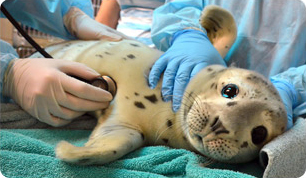 The Marine Mammal Center : Honey Girl Takes Baby Steps Toward the Recovery of a Species! » Honey Girl Takes Baby Steps Toward the Recovery of a Species! Honey Girl and her pup on the beach. Honey Girl, an endangered Hawaiian monk seal, was originally known as R5AY, the identification on the flipper tag that was attached to her when she was young. She was later rescued and rehabilitated in a collaborative effort between The Marine Mammal Center, NOAA Fisheries Hawaiian Monk Seal Research Program (HMSRP), the Waikiki Aquarium, the Honolulu Zoo, the Hawaiian Monk Seal Response Team Oahu (HMSRTO), and local veterinary specialists. In November 2012, Honey Girl was found on Sunset Beach, on the North Shore of Oahu, emaciated, weak, and covered in algae. Her mouth was injured and swollen, with a fishhook lodged in it along with a monofilament leader and “pigtail” connector. The entanglement damaged her mouth and tongue, making it difficult for her to forage for food. Honey Girl was brought to the Waikiki Aquarium in Honolulu, where she spent 13 days under the care of Dr. Michelle Barbieri, conservation medicine intern at The Marine Mammal Center and head of the NOAA Fisheries Hawaiian monk seal health and disease program. After the fishing hook was removed from her cheek, veterinary surgeon Miles Yoshioka performed the delicate surgery needed to repair Honey Girl's damaged tongue. Honey Girl was released back to the ocean on November 29. She was outfitted with a satellite tag, allowing scientists and researchers to track her travel patterns and learn more about Hawaiian monk seals. In January 2014, Honey Girl gave birth to a pup, the first Hawaiian monk seal born this year. Researchers have been monitoring Honey Girl over the years, and this is the sixth pup that she has brought into the world! Honey Girl has made big strides toward the recovery of the Hawaiian monk seal, a critically endangered species. Read more about Honey Girl. Learn about our efforts to Save the Hawaiian Monk Seal. Find out about how we are Working with Endangered Species.